I have to say Chutney recipes are quite popular in my kitchen, because Chutney is an easy dish on the menu to make Vj happy. So I have tried several Chutney Recipes (17 Chutney Recipes piled up so far) including exquisite Radish Chutney, Asparagus Chutney and Guava Chutney, and the experiments won't stop there. Today I have paired Bell Pepper with Carrot and twisted little with Tangy Tomato, and the result is Delicious Bell Pepper Carrot and Tomato Chutney, and nice addition to my Chutney Recipe Collection. Here is the recipe for you! Heat the Non-Stick Pan and add 1 tsp of oil. 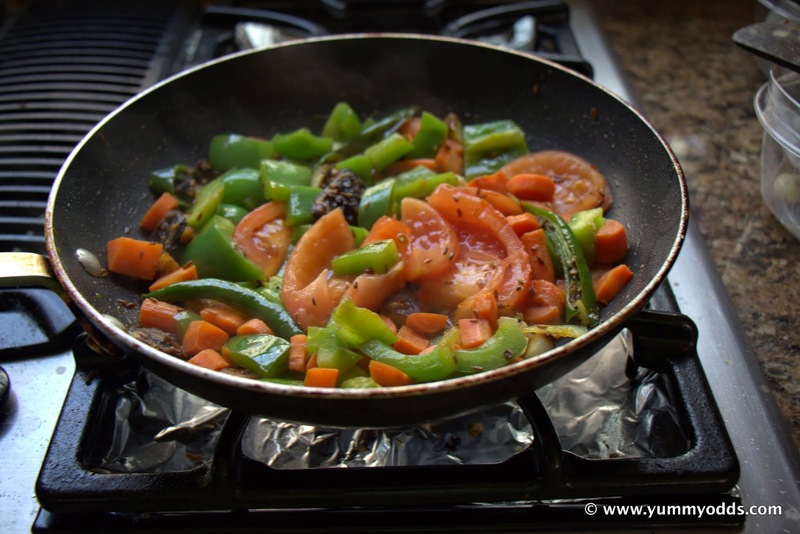 Add Bell Pepper, Carrot pieces to the pan. Sauté for 2 min, as the veggies get tender, add cumin seeds, green chili, garlic cloves and tamarind. sauté for 1 min, now add chopped tomato to the pan and mix everything well and sauté for 3 min. You will notice everything gets combined and comes together. Switch off the stove and let it cool in the pan for few minutes. Once it is cooled off, grind it in the small mixie jar or magic bullet until it becomes into fine paste. While grinding, add 1 tsp salt, taste and adjust accordingly. Now the chutney is ready, you can serve it is or add tempering to give crunchy twist. Tempering: Heat NonStick Pan, add 1 Tbsp Oil to it, once the oil is hot add red chili, chana dal, urad dal, mustard seeds in the same order. As mustard starts spluttering, add turmeric powder and curry leaves. Switch off the stove and add tempering to Chutney and serve with Hot White Rice and Ghee! until then take care and Happy Cooking! Oh Really! 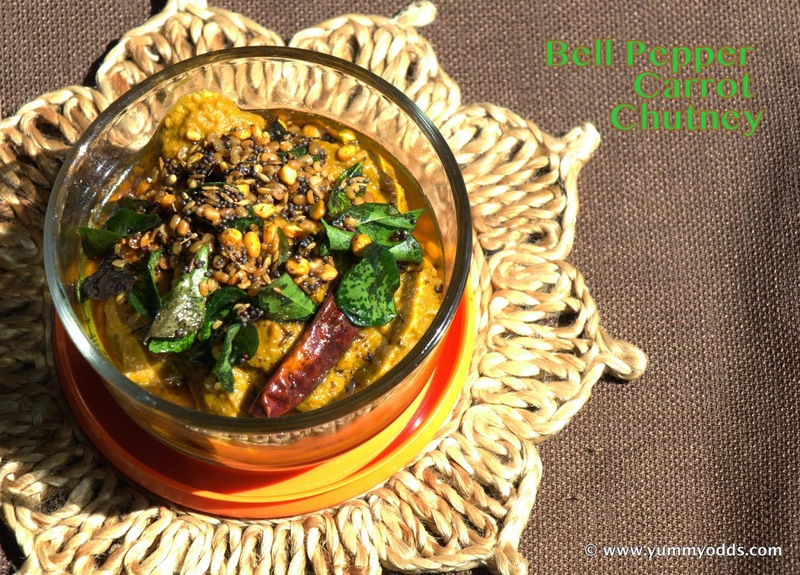 I have just tried Green Bell Pepper in Chutney for first time, loved it!